In this post, I'm including sources where I am able, as well as a couple of not so great images of my closet so you can sort of tangibly see what I've done. At one point in my life, like many women, I had a closet stuffed with clothing I mostly didn't wear, and I've downsized it hugely! About a year and a half ago, I got rid of about two thirds of what I once owned, re-evaluated my style and remaining items, and strategically filled holes in my wardrobe staples over the course of last year. But let me back up... I came across Jennifer L. Scott's Daily Connoisseur books (The Madame Chic series) on the recommendation of a friend and they have become some of my very favorite books ever!! 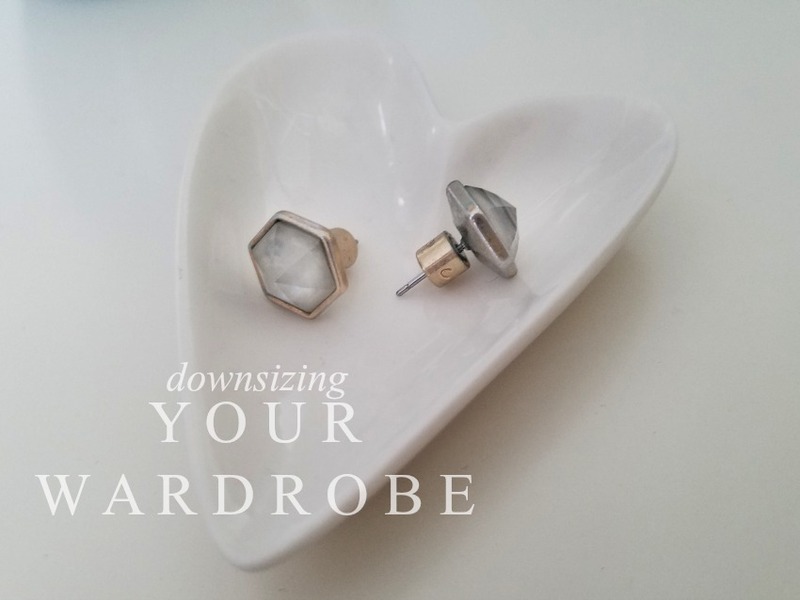 I won't detail reasons for downsizing a wardrobe to only what you love, wear regularly, or feel great in, but DO go and read her book (20 Style secrets). I highly recommend it. I loved her viewpoint and it has really impacted me. In fact, I've watched the overflow of this type of thinking change all areas of my life where purchases are made. It seemed to take about a year to fully curate my wardrobe into what is now streamlined, which is why I am just now getting to this post. I focused on quality, polished pieces that fit well. The reason it took me a full year, is because I really found myself thinking it out, proceeding slowly, season by season, and also -quality clothing can be expensive. I used to save items that I might want to someday wear if just the right occasion happened, or save certain outfits for special. Jennifer's words about how we're special enough occasions to wear something polished and nice any time, even if we're home all day, changed my thinking. When you look presentable (and yoga pants only count if you're working out in them), you feel good and that changes everything! Just read her books okay? You'll thank me. Practically speaking, here's how I started. I followed her advice and tried every item on. Yes, EVERY item. It is imperative that you do this, so that you can evaluate stains, fit, cut, color, wear and tear, ask if you're comfortable, is the item your style, is it flattering to your unique body type (whether or not it's a trendy style) and finally, do you find yourself adjusting or pulling at it to make it better? I actually wore a few things half a day to determine this, though most things only took moments to evaluate. Once you answer all of those fit questions, it's much easier to decide if it's a keeper or not. Next, evaluate what you have left. I even begun a Pinterest board to see what I tended to like and quickly identified a style I was drawn to which helped me. I then used that to create the bones (or core items) of my wardrobe, using what I had, and made a list of items I'd like to purchase to complete that. (She speaks in her book about being free to delete items from your wardrobe even if you spent large amounts of money on them. Why keep it just because it was expensive? On the front end going forward, it's good to ask yourself all of those fit and style questions before spending money on an item and this has been really helpful to me in the dressing rooms! 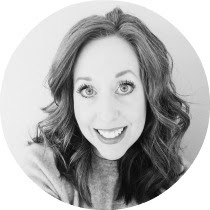 I identified my personal style which she encourages you to do in her books, and I'd say that mine is "polished classic with a preppy twist." 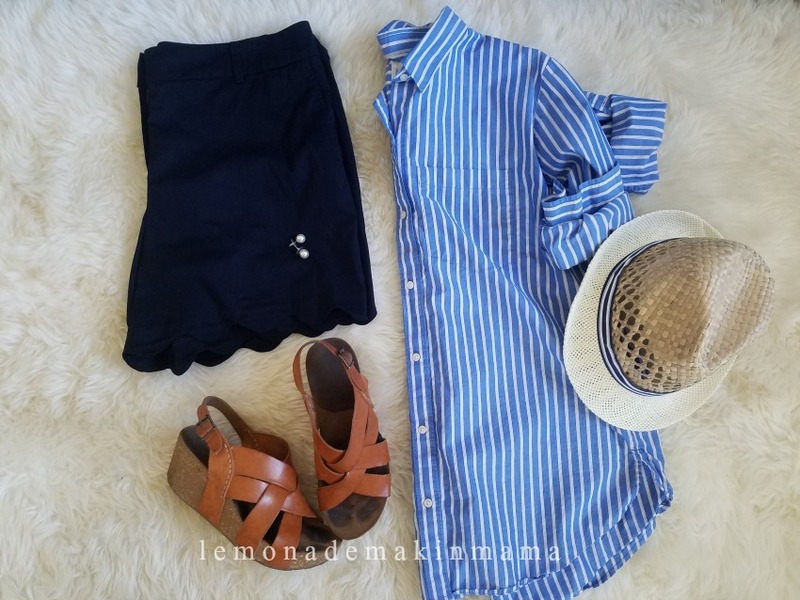 I love preppy button downs, and solid cashmere sweaters with blazers in the winter, denim dresses with ballet flats in the spring and fall, simple a-line dresses as well as solid tanks with quality leather sandals and easy, clean-lined shorts in the summer. This idea of streamlining to ten items, translates into outerwear, footwear and accessories as well. Once you begin really thinking about the way you want to present yourself, you'll find yourself truly considering your purchases and how they work together. My color palette continues to be neutrals and solids that work together and the occasional pop of fuchsia or cobalt and you can see a few of my favorite summertime go-to outfits below. Straw hat- old, not sure source. My daughter hates this hat, but I still like it. 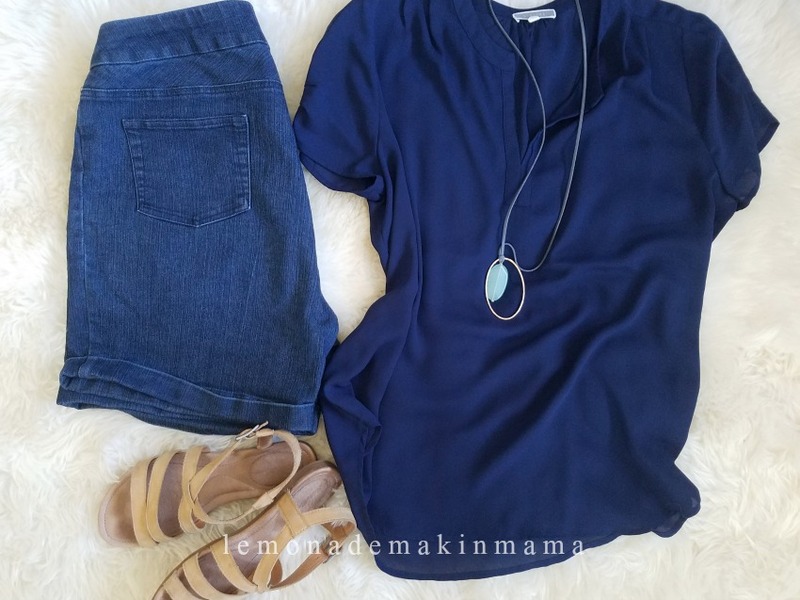 Denim cuff shorts- old, not sure source. Leather sandals- Eddie Bauer, a year ago. On the left side of my closet, I keep party dresses (I have two- one long and a cocktail dress), outerwear, and two current season career dresses, plus a blazer. Over to the right a bit you'll see the bulk of my core wardrobe. I keep several blousy tanks, and light tops, that coordinate with the summer bottoms, along with a few dresses, and that's it. My necklaces hang beside my clothing to the far right. You can see the out of season bins, which I store on the shelf, each holding about ten to twelve items. 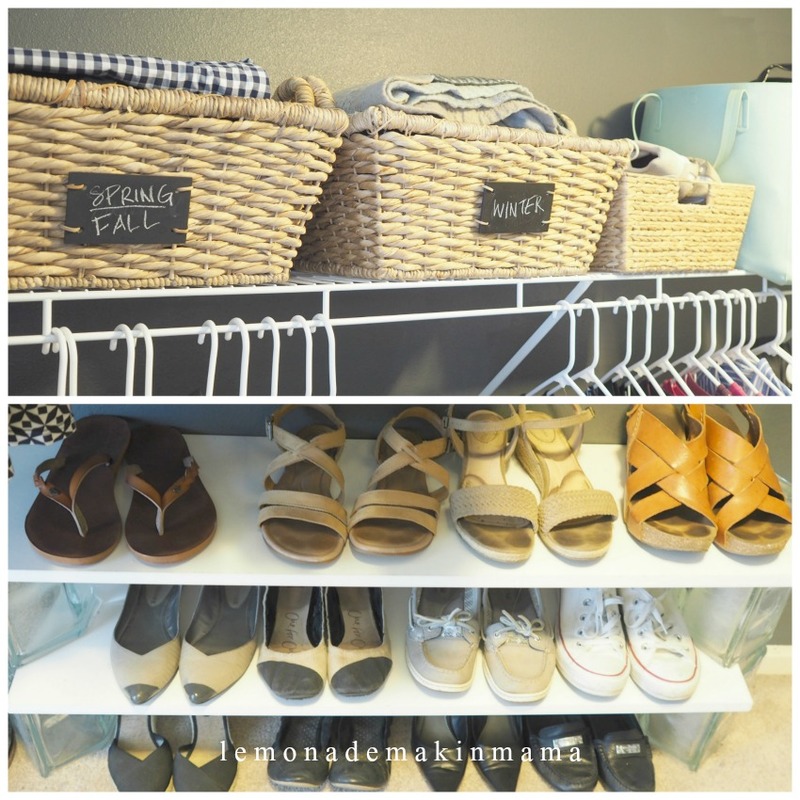 I also used some glass blocks and pre-cut shelves from Home Depot, for my shoe storage. I have three winter pairs in a bin on the shelf, that I will switch out with sandals as the weather cools. Not pictured here are a pair of black leather flip flops and some tennis shoes. Is this something you could see yourself doing in your own closet? Do you have any questions or thoughts about this? Please feel free to leave them in comments below and I'll do my best to respond. I had to pare down my closet a year and a half ago because of where we lived. Small closet forced me to only have and wear what I needed in that closet. Fast forward to us moving and I have a big closet space again, but I am not going to fill it. I need to edit again and let go of some things. I tend to gravitate towards blues and pinks and comfy, but well made clothing. thanks for sharing. I love those books and feel like I'm in my year of figuring out what works for me and my own personal style. I've had to unfollow some of my style gurus who post what they wear and where it's from because I've spent needlessly in my quest to figure out my own style and what I love. Thanks for sharing this journey...gives me food for thought and more motivation to finish up and clean it out!! Oh my word I hear you! It's so easy to get sucked in to what is trendy but doesn't actually work for our bodies. I love your closet!! Is Adrain's stuff on the right? I've been trying capsule wardrobe for a few years now but kept stumbling around just not loving it. Then I realized this summer that I had been trying to adopt other peoples' style rather than embracing my own (10 neutral pieces every capsule wardrobe needs, etc. )....so now I'm at it again working on a capsule wardrobe of pieces that make MY heart sing. Its fun to see how others do though! Haha Yes his is on the right. I'm working on getting him to do this too.. he has a TON of clothing! I really love this insight into how you approach your wardrobe. I've been collecting ideas on Pinterest, but it is SO helpful to see how you are doing in in the real world. I think that's why I've loved seeing Jennifer's videos too- just a real application makes sense to me! Seeing what she chooses each season has been super helpful. Thank you for sharing. You've motivated me to keep working on my style and weeding out what I don't need. I've read all her books and they were great. Yay! We can do this! It's super freeing girl... I can't even tell you! Go for it. Oh I hear ya on all of that Misha! I think the spending a bit more as we age is so great... we fall away from trends more and more naturally because we know what works for our style and bodies and it makes sense to invest in what works when we find it! Yes we need to enjoy another game... my kids don't seem to much care about them which is crazy! They are so fun. This is wonderful! I would love to see as you change seasons. I have also just ordered the books from my library. I feel clothes freedom coming! Thanks! Oh, look! The c+i studs you got from my boutique! Love those.